Knee replacement surgery seems to have reached maturity. In fact, it would appear to be as reliable, if not more reliable than hip replacement surgery which came into clinical use many years before the knee replacement surgery that we know today. 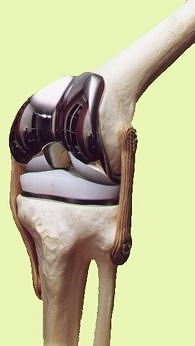 We know that the knee is more than a simple hinge. The knee replacement must adapt to a complex set of motions and it seeks to do so while maintaining as much of the normal anatomy as possible (especially the ligaments). Investigators have approached this through different designs which explains the number of different knee replacements models available on the market today. There are many types of knee replacements on the market today. 1) So-called unicompartmental replacements address only the part of the knee which is arthritic and leaves the remainder of the knee untouched. All ligaments are left intact. Knee replacements can be used to address the medial femoral-tibial compartment, the outer femoral tibial compartment or the patello-femoral compartment. These implants can be used to treat arthritis or osteonecrosis. They have been used for more than twenty years and they involve relatively little bone resection. 2) Total Knee Replacements. These implants remove all of the cartilage in the knee while attempting to maintain the normal physiology of the knee. These implants are recommended in situations of more extensive arthritis and in so-called inflammatory arthritides. These implants feature a plastic component which can be fixed or which can rotate. 3) Hinged Knee Replacements (rotating): These may be recommended when there is a serious bone loss and deformity present and/or major deficiency of the collateral ligament. Results from knee replacement surgery (based on pain and function) keep getting better and are now equivalent to those obtained with total hip replacement surgery. The recovery is relatively rapid as there is early assisted ambulation and no immobilization of the knee. The indication for surgery is mainly predicated on pain.